AMSTERDAM — For decades bright-eyed boy in the photograph was believed to be the legendary artist Vincent Van Gogh at the age of 13. But experts revealed yesterday that the picture is most likely not the Dutch Sunflowers painter but his brother Theo, was 15 at the time. The Van Gogh Museum in Amsterdam announced the shock discovery about what was previously thought to be one of only two photos of Vincent, and which has appeared in dozens of books. "With this discovery we are an illusion poorer and a portrait of Theo richer," said Axel Rutger, director of the Van Gogh Museum. "Of course there was a slight twinge of disappointment also because we have so few photographs of Vincent van Gogh and now we have even one less," he said. "But on the other hand of course I am always happy if you can discover more of the truth." The discovery leaves just one known picture of the artist, taken when he was 19 years old. While Vincent Van Gogh is famed for his vividly-coloured, emotionally turbulent self-portraits in oils, he showed a surprising reluctance to be captured on camera. "When I heard that this is most likely a picture of my great-grandfather Theo -- and not of Vincent -- I was surprised, but I am glad that the mystery has been solved," Willem van Gogh, Theo’s great-grandson and an advisor to the board of the Van Gogh Museum, said in a statement. Uncovering the case of mistaken identity took years of artistic detective work. The picture was taken by taken by Brussels photographer Balduin Schwarz in the late 19th century, but did not emerge publicly until 1957, in an exhibition by Mark Edo Tralbaut, a Belgian researcher who identified it in a catalogue as Portrait of Vincent Van Gogh (circa 1866). "It is the image that everybody knows as the portrait of the artist as a young boy," Teio Meedendorp, chief researcher at the Van Gogh Museum, said. But after a Dutch TV programme raised questions about it in 2014, the Van Gogh Museum launched an investigation. Coincidentally, another Van Gogh expert from Belgium, Yves Vasseur, had also started his own enquiries and got in touch with the museum. 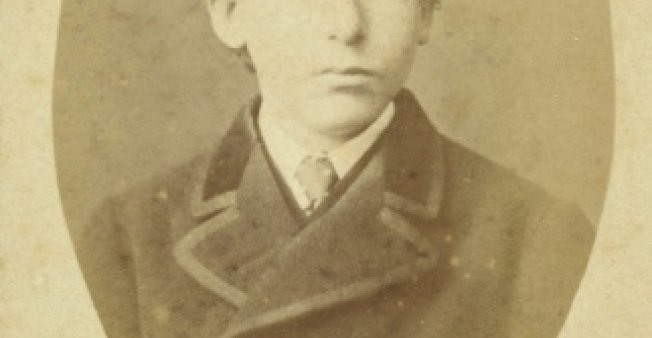 "The light colour of Theo’s eyes is especially striking in the known photographs of him, and this can also be seen in the Schwarz portrait -- this was another indication that the person in the portrait is probably Theo," added Meedendorp.